Today’s recipe is my 14 year old daughter’s handiwork. She adapted the recipe from one for mud pie in a book we own; we renamed it (the recipe, not the book!). I was her attempting-to-not-interfere-too-much assistant. 200g digestive biscuits (if you are outside of the UK and can’t get digestive biscuits, then graham crackers are often touted as being a suitable substitute for digestives in recipes, however graham crackers are drier and not as crumbly, so I’m not sure they would work as well in this). 175g butter (and you really do need to use butter rather than margarine so that the base sets firm). 1) Break up the digestives, but not too finely, they need to look like rubble. 2) Melt the butter, stir in the sugar and cocoa until smooth, then pour on to the digestive rubble and mix well. 3) Press it firmly into a rectangle dish or tin lined with foil. Chill for at least 2 hours. 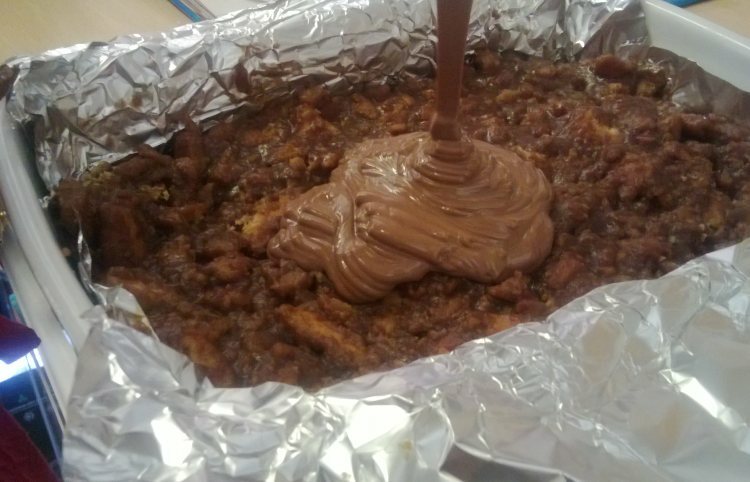 4) Melt the milk chocolate, pour it over the base and spread it across evenly. 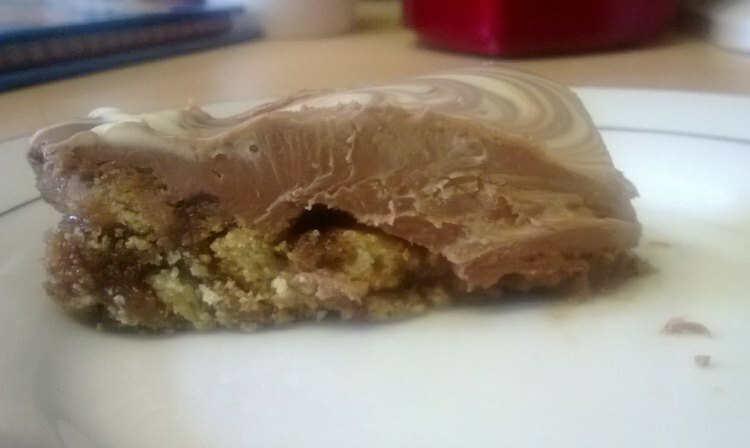 5) Melt the white chocolate, spoon it over the melted milk chocolate, and then use something thin and pointy to marble it into the milk chocolate. Chill until chocolate is firm. 6) Cut into pieces. 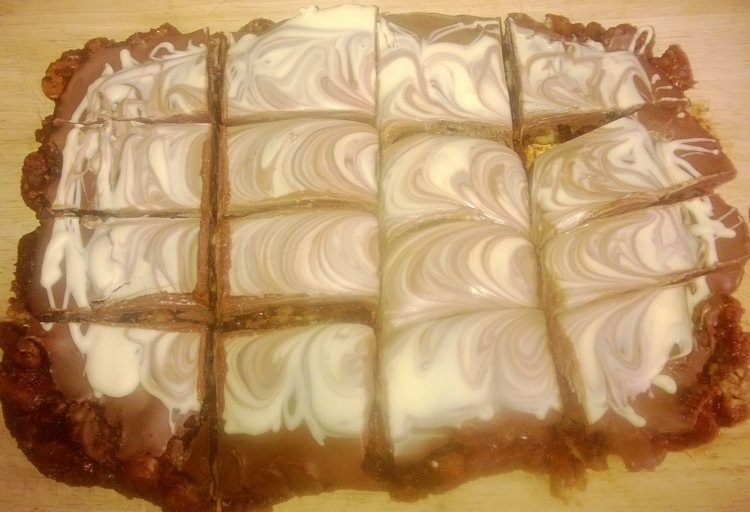 It’s pretty rich and sweet with all that butter and chocolate, so you won’t want to cut your pieces too large! Actually, that’s interesting to know. Thank you. And as for “they’re practically medicinal!” I think adding the chocolate as you have makes them even more so! 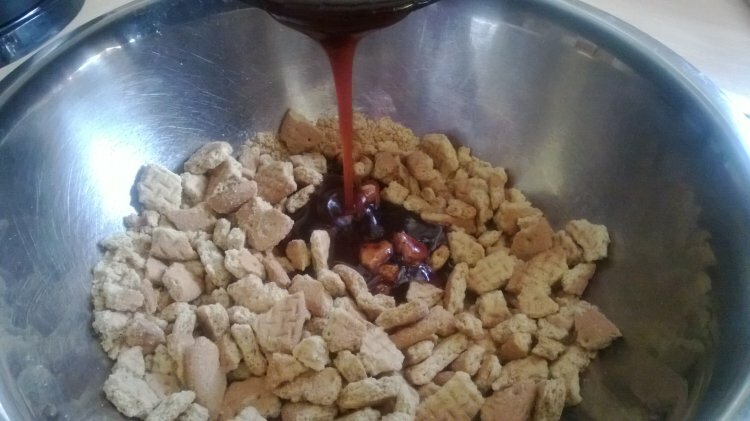 The closest equivalent is graham crackers – the’re not exactly the same but I’ve seen several different recipes say that they are interchangeable. But you can actually get digestives in the US, anywhere that sells British food will have them because they’re a staple over here that have been around forever, so they’re something that Brits abroad will want to seek out! Yum yum yum yum. That is all. I actually prefer digestives, for the reason you mention – they’re less sweet than most cookies (though, I can’t bring myself to consider them a proper cookie), and their texture is more cracker-like than a lot of alternatives. I suppose we’re lucky that many shops in our area sell digestives. I’m not sure if they’re actually imported or just American equivalents, though. I’ll have to look into that. If the digestives you have there are made by McVities then they’re probably the genuine article! (There are other makers of them, but McVities are the main one, and when I was living in the States I saw McVities digestives wherever they sold British food) – I agree that the word ‘cookie’ doesn’t really work for them though! I personally don’t think butter is a huge evil, it’s more natural than a lot of the very processed, supposedly more healthy spreads. As long as it is eaten in moderation, and taken in the context of your fat intake as a whole, then I think it’s an acceptable inclusion in a healthy diet. Not sure I can say the same about the sugar content of this recipe though! I can only manage a small square of this at a time because of the richness. I can’t quite get over the fact that digestives aren’t available EVERYWHERE! I think they are really, they just have to hunt a bit harder to find them elsewhere! They’re the best dunking biscuits if you’re a dunker (I am, but don’t tell anyone).